Les Mediterranees Charlemagne is a stunning 5 star family friendly campsite that offers something that is completely unavailable anywhere else in the Languedoc region of France. Not only do you get access to all of the brilliant facilities and activities available on Les Mediterranees Charlemagne campsite but you also benefit from being able to use the facilities and activities on its sister campsites Les Mediterranees Nouvelle Floride and Le Beach Garden, which are within walking distance of the campsite. With the added benefit of having three campsites in one you really are spoilt for choice when it comes to the fantastic range of activities and facilities you’ll have access to when on holiday in the Languedoc. Plenty of care has been taken, not only in the campsites location but also in the layout and style. A variety of green and colourful plants, trees and shrubs ensure that you not only benefit from some welcome shade but also that you have that real sense of being in paradise. This fantastic modern resort is just 200m from the local beach where you’ll find not only plenty of sand but also plenty of space where you can swim, play, relax and have fun. One of the most important things to consider when choosing your holiday location is of course the swimming pool area. 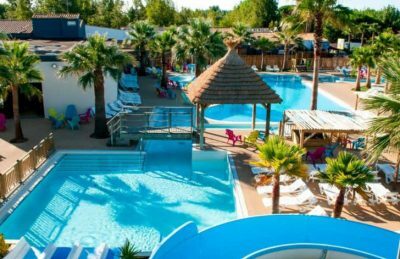 As we’ve already said, you get access to two other swimming pool facilities at Le Beach Garden and Les Mediterranees Nouvelle Floride campsites however the swimming pool area at Les Mediterranees Charlemagne is also fantastic. Featuring 2 outdoor heated pools, an indoor heated swimming pool, lazy river, paddling pool, wellness centre, a variety of slides and not forgetting the sunbathing areas you really will be spoilt for choice. Les Mediterranees Charlemagne is fantastic 5 star family friendly campsite and as such the on site activities and facilities are superb. On site activities at Les Mediterranees Charlemagne campsite include football, basketball, volleyball, swimming lessons, boules, playground, cycle hire and don’t forget you also get to use the activities at its sister campsites..
Facilities available at Les Mediterranees Charlemagne campsite include WIFI, restaurant, snack bar, pizzeria, takeaway, bar, groceries, animation team, games room, washers and dryers. Accommodation at Les Mediterranees Charlemagne campsite includes a range of 2 and 3 bedroom mobile homes that are available from Al Fresco Holidays. Click the button below to book your camping holiday in France with our travel partner, Al Fresco Holidays.